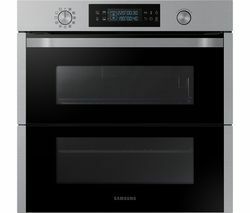 Perhaps better known for electronics products like TVs and smartphones, Samsung is now applying its world-leading tech expertise to ovens. The results are seriously impressive. Take the sleek stainless-steel NV66M3531BS Electric Oven, a stylish modern looking multifunction oven that will instantly add a dash of sophistication to any kitchen. But, impactful though the NV66M3531BS’s dashing looks undoubtedly are, this innovative oven is all about the clever technology it’s equipped with. Dual Cook technology gives you two cooking zones within one Samsung oven, meaning you can prepare two different dishes completely independently at different temperatures and times, with no mixing of flavours or aromas. And all within a space-saving single-oven build. With a large capacity of 66 litres there's ample space to make big meals for friends and family. Bake a cake in the bottom while you heat fish in the top, and make dinner and dessert at the same time. Even more convenience comes courtesy of 25 Auto Cook programmes that have been developed to help ensure you always have the right temperature and cooking time in place no matter what you're making. All Samsung ovens are all wonderfully effortless to clean thanks to a catalytic liner at the rear of the oven absorbs grease and oil splashes from cooking. Cooking at high temperatures turns the residue into ash, to be easily swept up with a dustpan and brush. If you’ve ever suffered the laborious task of cleaning a traditional oven you’re certain to appreciate this labour-saving design feature. 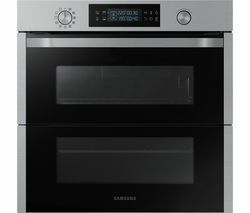 When you’ve finished perusing our Samsung ovens, check out our collection of Neff ovens, which includes an extensive choice of sleek, expertly engineered gas and electric ovens. And be sure to see all Zanussi ovens in our collection.